Because pain management is such a complex field, it’s particularly important for your EHR to acknowledge and respond with intuitive, dynamic and targeted solutions. Until recently, few pain management-specific EHRs were available; instead, pain management specialists had to settle for the time-consuming and expensive task of overhauling general EHRs to meet their demands. The less-than-ideal results were consistent with the findings of the Certification Commission for Health Information Technology, which has determined that specialty-specific EHRs offer the highest performance in terms of meeting both patient and practice requirements. According to a Substance Abuse and Rehabilitation article, EHRs offer a solution to "current, fragmented behavioral health treatment" while enhancing the standard of care for substance abuse interventions and treatments. Read on to learn what features are essential when it comes to evaluating and treating pain management patients. Customized forms, diagrams and templates can help pain management specialists better assess the pain site and nature of pain while also gleaning relevant neurological information. Continuity of care is critical in pain management, and EHRs optimize the coordination of care through fast and accurate automated reports to primary care physicians. Claims coding for pain management is a sophisticated process -- particularly when you factor in rigorous ICM-10 coding demands. Automated or assisted coding helps prevent both diagnostic and procedural mistakes thereby saving you from expensive, time-consuming errors. Because pain management patients are at increased risk of medication abuse, the need for tracking of medications is critical. EHRs not only help ensure that prescriptions are filled, but can also play a valuable role in thwarting prescription drug abuse if integrated with PDMPs. Because pain management requires the integration of multiple healthcare disciplines, EHRs with the ability to seamlessly communicate with other medical offices, retrieve lab results and access radiology findings offer expedited treatment planning. 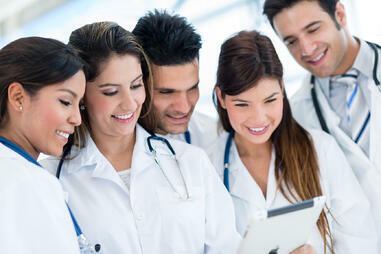 As your practices grows and changes, so do your EHR needs. An agile and robust EHR will smoothly accommodate changes in personnel, workflow, and other factors to provide consistent, uninterrupted functionality. An increasing number of healthcare practitioners are choosing to store their data online in the cloud as opposed to via on-site servers. Cloud computing offers enhanced security, cost savings, staff time savings, data retention, improved search functionality, disaster recover, and scalability. While costs may vary between Pain Management EMRs, the best systems share a common thread: transparency. Understanding the cost of your EHR is an essential part of budgeting for its usage. EHRs for pain management have changed immensely over time. As opposed to the generic EHR templates pain management specialists previously had to work with, the latest EHRs now offer increased functionality in the form of pain management EHR templates which can be used “as is” or adapted to meet the specific needs of any healthcare setting -- from hospitals to private practice. When selecting a replacement EHR for your pain management practice, it’s important to consider the unique challenges of treating patients with chronic and acute pain. Today’s physician-developed EHRs are designed to readily integrate with the daily routine of pain management specialists, while significantly benefiting your practice and yield desired outcomes -- both in terms of productivity and patient care. For more information about why RevenueXL’s PrognoCIS is the best EMR for pain management, or to learn more about how our Certified EMR solutions can improve your practice's workflow and quality of care, contact Revenue XL today.